The 7th annual soil and nutrition conference organisers are committed to raising the quality of nutrition in food, beyond organics. Dan Kittredge, this year’s keynote speaker and founder of the Bionutrient Food Association has taught 2,500 farmers, in 27 states in the last 6 years how to grow food with high Brix levels. On the first day of the conference Dan will introduce the Bionutrient Meter, which any consumer can use to determine which vegetables, fruits, flours, and the highest in nutrition, and buy those. Over the past several decades the concentration of vitamins and minerals in our food has steadily decreased and unsustainable industrial agricultural practices have polluted water tables and undermined ecosystems The rate of degenerative diseases like Alzheimer’s, diabetes and heart disease have increased during this same time period. While correlation and causation are not the same thing, the food and water we consume undeniable has an effect on our overall health and well-being. 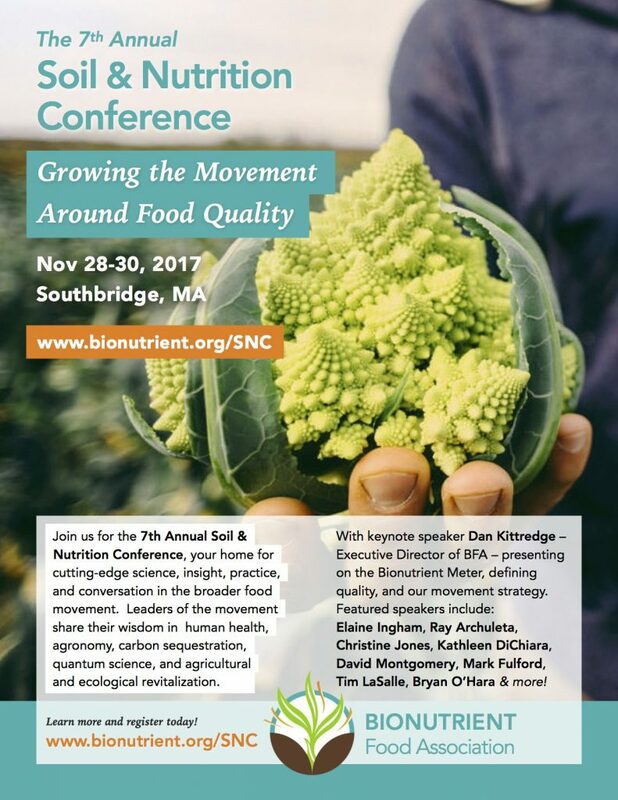 This conference will explore the principles, techniques and practices at the intersection of farm and human ecosystems that can be applied to improve environmental sustainability, food quality, and overall well-being by bringing together the collective knowledge of the food and environmental movements and by integrating diverse viewpoints.